Submitted Photo Left to right Phyllis Lauder, Chairperson, Maggie Blackburn, Kelsey Turner and Ron Jones, Committee member. Maggie Blackburn, the daughter of Jim and Patty Blackburn of Minford, and Kelsey Lynn Turner, the daughter of Mark and Angle Turner of Wheelersburg were awarded the Order of the Eastern Star Scholarships for Adams and Scioto County in the amount of $500 each. The scholarships are awarded to persons who have attained the rank of sophomore or higher in a 3 or 4 year program in an accredited college or university. The recipients must have attained a 3.0 GPA or higher and the award is not based on “need”. The student does not have to be a member of a Masonic or Eastern Star organization nor be related to any Mason or Eastern Star member. Blackburn is sophomore at the University of Kentucky majoring in Elementary Education and a Masters in Speech Pathology. She is an Honors Program Student, a member of Delta Zeta Sorority, has volunteered at the St. Agnes House of Lexington which is a “home away from home” for those in need. She also is an EdLife (Education) Peer Mentor, CRU member and a member of many other organizations. Turner is a sophomore at Marshall University majoring in education K – 6 and is on the Dean’s List. She is a member of the National Society of Collegiate Scholars, and has volunteered with “Backpacks for a Cause”. She is a member of Campus Crusade for Christ. Kelsey also did 180 days of community service in Kindergarten Classes at Minford Primary School. Both recipients hope to return to Scioto County to teach after graduation. 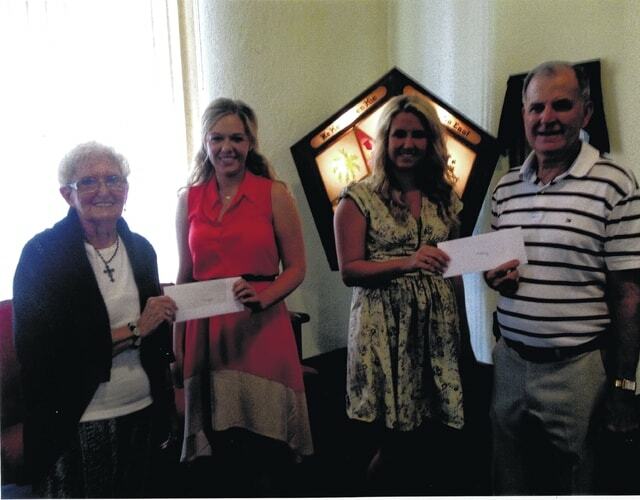 Making the presentation of the scholarships were Ruth Smalley, a member of West Union Chapter, Ron Jones, a member of Lucasville Chapter and Phyllis Lauder, a member of Wheelersburg Chapter. The Order of the Eastern Star is the largest fraternal organization in the world to which both men and women can be members and it is composed of people with deep spiritual convictions of all faiths. It is committed to helping those in religious training, cancer research, heart fund, our youth and the Shriners Hospital.